Infinitely Polar Bear is a deeply personal tale of a family doing their best to overcome economic uncertainty, mental illness, and the class/parental struggle to provide a better life for their children. Filmmaker Maya Forbes executes the dramatized story of her family growing up with her own thirteen-year-old daughter portraying a fictional version of herself in this charming yet often difficult film. Mark Ruffalo continues his unending streak of diverse yet imminently believable roles as the titular bi-"polar bear" trying to deal and cope with his manic-depressive state and troubling mood swings while taking care of his two young daughters and mending a troubled marriage to Zoë Saldana. She's just as able and complex in her ambitious but often conflicting roles as wife, mother, and breadwinner. Full of authentic performances and emotionally raw material, the film is so honest about one family's constant state of turmoil. Forbes juggles the shifting tone of the film's narrative deftly as all the actors showcase both their dramatic and comedic skills in an exercise of constant balance from scene to scene. 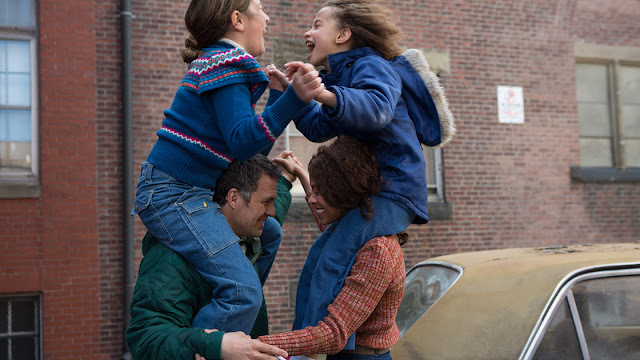 Ruffalo and Saldana's mixed raced children growing up during the uncertainly of post-Bohemia 1970s Boston are played impeccably by Imogene Wolodarsky (Forbes' daughter) and Ashley Aufderheide. Both give uniformly excellent and playfully sweet performances as they express their conflicted feelings of love and frustration with both their parents. They treat the film's often heavy subject matter with a much needed grace and charm while offering wholly identifiable reactions to the chaos around them. Forbes does an admirable job in fictionalizing her own family's history and her unconventional childhood into a fairly compelling comedic drama about the complications of both fatherhood and motherhood during mental and economic distress. It's difficult to knock Infinitely Polar Bear for any of its cuteness or quirk given how honest and genuine the film feels on the whole, particularly during some of the dramatically darker scenes during many of the parents' struggles and subsequent reactions of the children.